Each drawing elements is painted very smoothly. So you can get very nice business cards when your designs are translated to printing. Supports alpha blend completely. Each layer object is allowed to contain an alpha channel. An vector object can filled or storked with different transparency level. 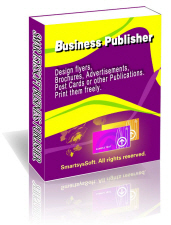 Select from attractive business card templates and customize with your text and symbol to create stunning business cards. 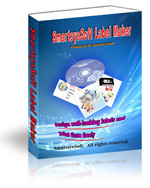 Provides thousands of pre-defined backgrounds, symbols, shapes, gradient style, textures and clipart images. In addition, all common image formats are supported so you can use your own pictures, logos and clipart to design the perfect custom business card for you. Supports to print your cards on any local Windows compatible printer. ave your designs as a high quality images with PDF, BMP, JPEG, GIF, PNG, TIFF format for outside quality printing.